If you live in a cold climate, you know having the right gear is pretty much essential if you plan on spending any amount of time outdoors. Enter UF PRO. Last winter I reviewed the UF PRO P-40 pants which coupled with the removable liner are great for cold weather outings, and today we’ll take a look at the Delta AcE Sweater. When I hear “sweater” it brings to mind something ugly that folks wear to holiday parties (I’ve never understood Ugly Sweater parties by the way). The Delta AcE Sweater is a completely different animal. 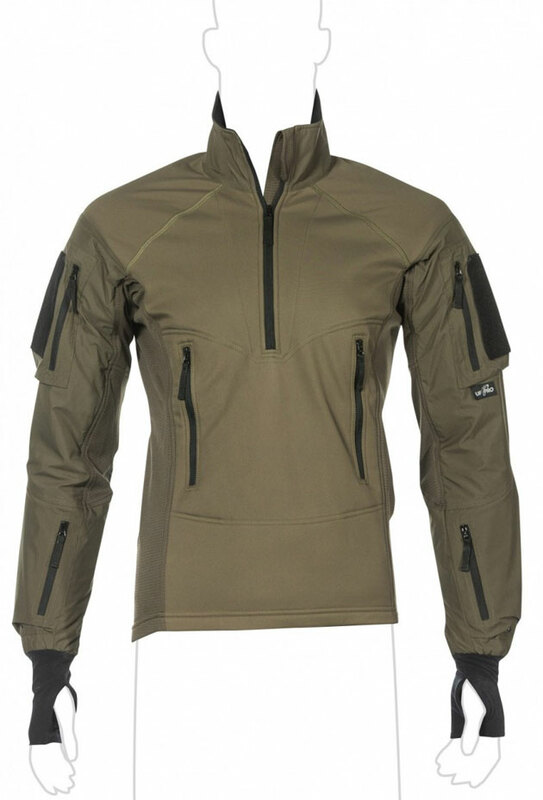 As you would expect from UF PRO, the Delta AcE Sweater is designed specifically for tactical use, and in this case specifically for cold weather. Even though this isn’t my world, I was able to test the sweater out in cold weather outings in the Montana fall/winter to see how it would perform. If you spend much time in the mountains of Montana during fall, you really have to be prepared for wide range of temperatures and weather conditions, which means layering. The AcE Sweater, in my opinion, was designed to be used as an outer layer, but I also found that it breathes well enough be used as a mid-layer. Sadly I somehow managed to lose a lot of my hunting photos, but a few survived. 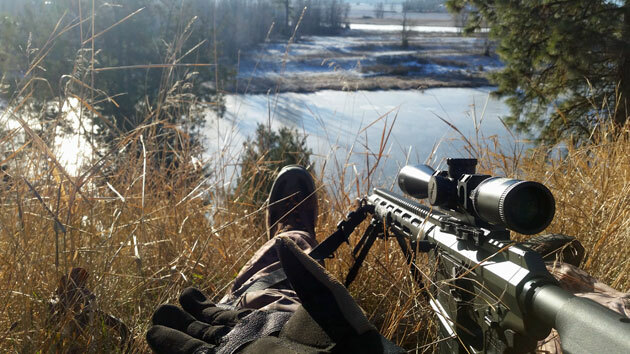 This is me around late November trying to call in coyotes after an unsuccessful morning hunting whitetail. The Delta AcE Sweater is constructed from three different materials, with very apparent attention to detail. I wear a backpack on most of my outings, and I tend to sweat a lot, so I appreciated the quick drying micro fleece material used in the back and armpit areas. The material in these areas is thinner than in the other areas, so while it vents well, if you don’t have on a backpack, vest, plate carrier, etc, your back might get cold. The shoulders have padded inserts, which I wasn’t too sure about at first but I ended up liking, and the sweater has a bunch of pockets. 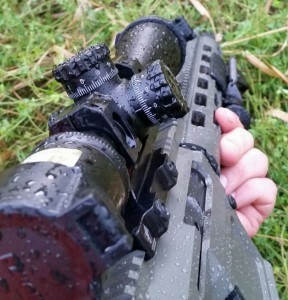 Sometimes you get caught in the rain, snow, sleet, etc, and while the Delta AcE is not waterproof, it is water repellent. If you get caught in a quick shower with just the AcE Sweater, you should be ok provided you have something covering your back (the thinner micro fleece area), but anything more will require either a hard shell or some other weatherproof layer. This isn’t a problem for me, I always keep a lightweight rain jacket in my pack one size larger than I normally wear so that I can throw it on over whatever layers I’m wearing if I get caught in the rain. Which brings me to fit. Besides being European sizing (which runs smaller than US sizing), the AcE Sweater is made to have a snug, athletic fit. This goes back to intended application, which is tactical use. If you’re running a vest, plate carrier, rifle, whatever, you don’t want a baggy outer layer that will get in the way. The AcE sweater is a purpose built cold weather garment, and in this function I think it excels. I am 6′ tall with a 44″ chest, and I normally wear L or XL, but in the Delta AcE Sweater I wear 2XL. Make sure to check their sizing chart before ordering. I’m not kicking in doors looking for bad guys or fast-roping out of helos like Brian Williams of NBC Nightly News fame, so I don’t go full kit very often. Even when I take carbine classes, I rarely don the plate carrier, but if that’s your world, UF PRO makes some fantastic gear you should take a look at. The quality is some of the best I’ve seen, and the garments are purpose built for tactical applications. LMAO at the Brian Williams comment…looks like a nice piece of kit, great review. WOW!! This sounds like its exactly what Ive been hoping for!! One thing that annoys the crap outta me is how my back sweats when Im using a back pack! I cant wait to try this. Thanks, Brandon! !